Dumpster Rental in DeWitt, Iowa - Roll-offs and Waste Management. 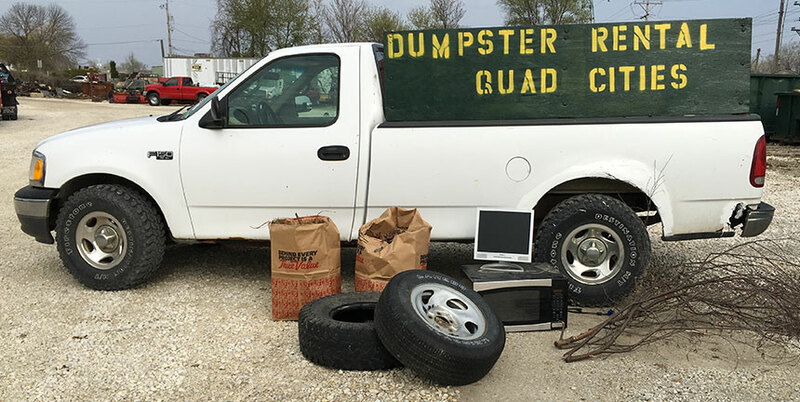 Dumpster Rental Quad Cities goal is to make your DeWitt, Iowa dumpster rental experience as simple as possible. 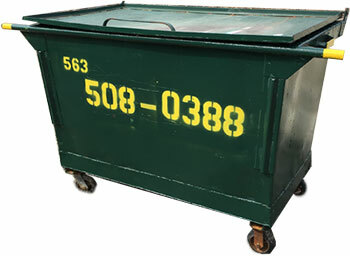 If you’re a first time roll off bin renter in DeWitt, you might have some questions for us relation to dumpster prices, dumpster sizes, placement of bin once it arrives, etc. But thats why were here- To answer your questions about our waste management service in DeWitt, Iowa. Weekly residential curbside garbage and recycling collection provide by the municipalities and area waste management companies. Commercial waste collection for restaurants, office complexes, schools, etc. Recycling services for residential and commercial accounts. From cardboard the scrap metal, private garbage companies provide these services in DeWitt, Iowa. Junk removal services provided by DRQC and 1 800 junk removal companies from out of the DeWitt area. 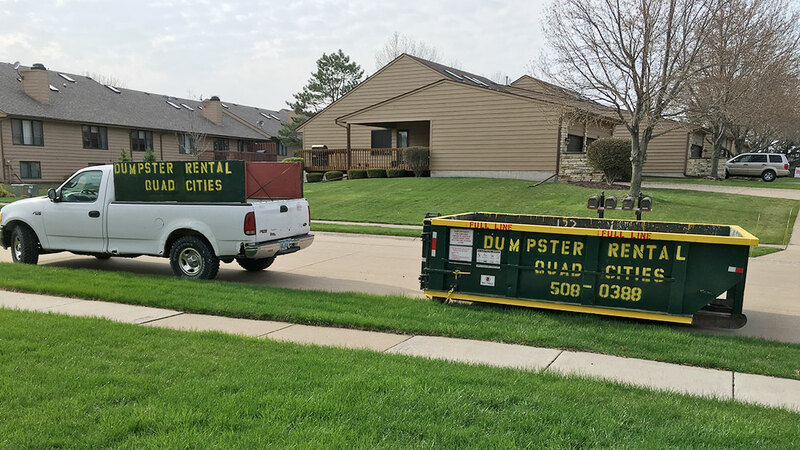 Small and large roll off dumpster rental in DeWitt and other Clinton County cities and towns. 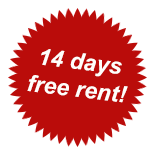 DRQC has an easy to understand pricing structure for our roll off rental. Our charges usually consist of a haul rate, tonnage charges for heavier materials, and daily rental fees for equipment kept by customer for an extended period of time. We are always upfront about our charges so that there are no surprises for our customers once our bins have been ordered. Other waste companies like to surprise customers with admin fees, environmental charges, and fuel surcharges. Consider the questions about your project, your debris, your timeframe, and your volume of waste. What questions do you have for your local waste management company. Where you might want your waste bin placed once it arrives at your location. The first question the DeWitt, Iowa Waste Management Company will ask is “what city do you live in? ” They ask this question because dumpster rental prices in DeWitt are somewhat determined by the distance to the local landfills. In other words, the farther the distance to the landfill, the more the waste customer pays. The next question that will be asked is”what type of material will you be putting in the rented dumpster?” Dumpsters come in several sizes and certain types of more dense materials can not be disposed of in the larger size dumpsters as they would be too heavy for the trucks to haul. So having an accurate list of waste materials and the total volume of the materials will help in determining the correct size dumpster for your project. First and foremost, you’ll need to know about the charges, prices, and fees associated with the waste removal activity. Most dumpster companies charge haul rates for each tome the dumpster is emptied, rental charges for dumpsters kept on-site for extended periods of time, and sanitary landfill fees for dumpsters exceeding certain weight thresholds. It is paramount that you ask about them, and any other fees before ordering the container to avoid being surprised by additional hidden charges later. You might also want to inquire about materials can not go into the dumpster. Appliances, e-waste, tires, grass clippings, flammables, liquids, are just a few of the materials that are banned from dumpster disposal by state and local authorities. Rented dumpsters are large heavy objects which take up a pretty good sized piece of property. The dumpsters themselves are roughly 20 feet long and are delivered by large trucks which are about 35’ in length and need another 15’ to maneuver. Hard level surfaces like gravel parking areas, sturdy driveways, or in some cases streets where parking is allowed are usually good spot to place a roll off bin. Remember the area should be free from overhead obstructions such as three branches and wires and ideally be close to thew waste which will be discarded. Volume is the obvious factor for determining the size of the bin needed for your project, however the density of weight of the waste material must also be considered. Dense materials such as dirt, shingles, brick, concrete will cause our dumpsters to bee too heavy for legal transport to disposal facilities. Simply put, 10 yard dumpsters might be required to handle the concrete arising out of a driveway removal or rubble generated from the demolition of a stone/dirt structure. Also, dumpsters are usually abut twenty feet long in length and are delivered by large vehicles which require plenty of space to maneuver. So you’ll need to find a hard, level, truck accessible area which is free from overhead obstructions(wires, tree branches, etc) for your dumpster to be placed. Sturdy driveways, gravel areas, parking lots, and city streets(where ordinances allow) are all possible dumpster locations. A ten cubic yard bin might be necessary in tight areas. DeWitt, Iowa, home of Lincoln Park, Wapsi Wildlife Management Area, Paarmann Park, and The DeWitt Central Sabers, is a wonderful place to raise a family or just to visit. We try to make dumpster rental in DeWitt, Iowa simple so you can get on about your life and enjoy all that DeWitt has to offer.